I have to import about 1,000+ Categories that are 4 levels deep. Is there an easy want to bulk import categories? I have DataGrab, but I don't think it handles Categories. I would also rather not mess with the database if I don't need to, as suggested here: What's the best way to bulk add or import categories? Data Grab does support category importing (See configuration grab) but as part of entry import (as far as I'm aware), so possibly discard entry information after import if it's not needed...? 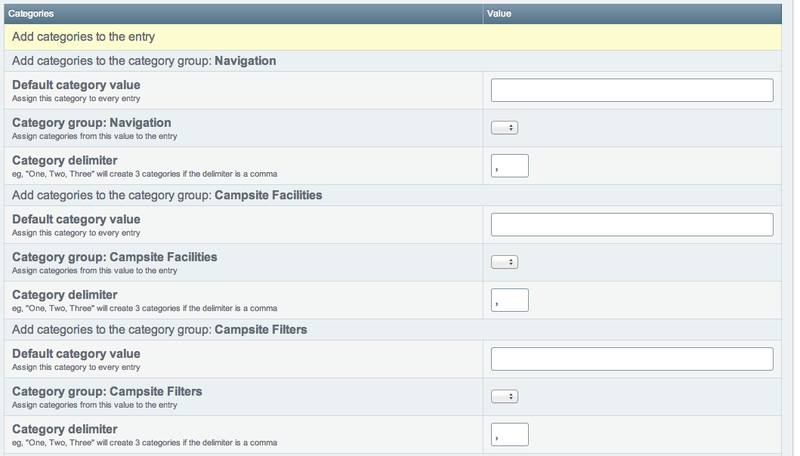 You could also possibly have all the categories imported with 1 entry? If a category already exists, it won't create a new one but utilise that one. By accident I discovered it handles multiple depths creation and assignment as I don't recall seeing any documentation on this. I had some categories with "/" in the title - it uses this as a category parent/child identifier. I've only stumbled on this as a 2 depth solution, so unknown if 4 levels would work, but if you already have DataGrab it's worth updating to latest version and giving it a test. If you import "Category1/Category1a" with first creating it's parent, the parent is automatically created with the url_title generated automatically from the name. Categories for e-commerce: n-level deep?